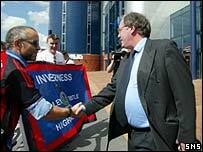 The Scottish Premier League has voted in favour of Inverness being promoted in Tuesday's second ballot. The First Division champions' ground-sharing proposal with Aberdeen received a 10-2 majority backing. Partick Thistle, who finished bottom of the SPL, failed in a legal bid to halt the meeting and have said they will not appeal the decision. The SPL also voted to approve stadium requirements of 6,000 seats instead of 10,000 from the season after next. Partick appeared to have been saved from relegation when the 12 clubs initially voted 7-5 in favour of Caley Thistle's proposal to share Pittodrie - one short of the eight required for change. But Hearts and Hibernian forced a second vote on the grounds that the clubs had received unclear advice in making their original decision. "The figures were 10 in favour of the Hibs-Hearts resolution and two against," said SPL executive chairman Lex Gold. "We have also voted through the reduction from 10,000 seats to 6,000 and, in future, decisions of this kind will be decided by the board of the SPL so we have taken some huge steps forward." It is understood Inverness failed in their initial attempt because the top flight clubs believed that groundshare plans had to be in place by 31 March. On the face of it, it's a defeat for Partick Thistle but it's a victory for football and common sense. The Highlanders' agreement to share Pittodrie came after that date but the deadline only applies to plans to upgrade own stadia, not ground-sharing. Inverness have arranged to play 100 miles away in Aberdeen as their Caledonian Stadium only has 2,300 seats. Partick attempted to block the second ballot but their application for an interim interdict was rejected on Tuesday morning at the Court of Session. Lord Brodie heard submissions from both sides on Friday and Monday but ruled against the Glasgow club, allowing the SPL clubs to vote again on Inverness' bid for promotion. Responding to the legal ruling, Jags' chairman Tom Hughes said: "I think the fact that the judge took all this time thinking about it shows what a complicated issue it was." And turning his attention to the SPL's second vote, Hughes added: "On the face of it, it's a defeat for Partick Thistle but it's a victory for football and common sense. "A lot of hard lessons have been learned and the SPL will be better for it. "There will now be greater certainty regarding the rules." Partick held a board meeting after the second votes were cast and the club have accepted their relegation. An appeal to the Scottish Football Association was still available but co-manager Gerry Britton confirmed this would not be lodged. He said: "We have decided that we are not going to appeal against the decision. "Obviously we are disappointed about the goings-on but we feel there has been too much instability and we need to move on." A separate proposal for the new 6,000-seater rule to be brought forward a season to allow Inverness to play at their own Caledonian Stadium was unlikely to succeed said Gold. He concluded: "There was a reference to it but it was not discussed. It remains a matter for discussion but to me seems less than probable."